I've watched quite a few silent films and have found them mostly enjoyable. Possibly my favorite silent movie is Fritz Lang's Metropolis. The production quality of this movie is amazing and there is a newly restored version with footage thought lost for decades. Every science fiction fan needs to see this film at least once in their life time. As a Batman fan naturally I was curious so I decided to watch the silent version of The Mark of Zorro. Its a really fun swashbuckler adventure and I highly recommend checking it out. I also recommend a movie called The Dragon Painter. I had a lot of fun watching films starring Buster Keaton, Charlie Chaplin and Laurel & Hardy. My preference is more the macabre and I think some of the best horror films of all time come from this era. Films like The Cabinet of Dr. Caligari, F. W. Murnau's Nosferatu, The Hands of Orlac, Haxan, The Phantom Carriage, etc. really capture the mood and atmosphere that is necessary to tell a good scary story. Something many more modern films completely lack. Way-back in school we were forced to watch Lon Chaney, Sr. in The Hunchback of Notre-Dame by our English professor and at the time I never gave it much thought. In fact I kind of prefer the Charles Laughton version. I still love the way he delivered the line "Sanctuary! Sanctuary!" It wasn't until I saw Chaney in The Phantom of the Opera that I really started to appreciate these films for great works of art. There is this scene at the masked-ball where the Phantom shows up disguised as Poe's Red-Death. It changes to mostly color and it really blew me away. Since then I've checked out many other Chaney works including The Ace of Hearts, Tod Browning's The Unknown as-well-as going back to re-watch The Huntchback. In The Unknown Chaney plays a murderer who has two thumbs on one hand. He poses as a man with no arms, joins a carnival as a knife thrower and falls in love with a girl there. Its really creepy and easily one of my top 3 favorite Tod Browning films. The Monster has everything a B-movie should have including a charismatic villain with creepy henchmen and an atmospheric setting. I especially love the fact that the lead character is not a typical hero type. Instead he is a bumbling detective who literally gets his badge, gun and diploma through the mail at the beginning of the film. Chaney plays Dr. Ziska a mad scientist who performs ghastly experiments at an abandoned sanitarium and it's up to our would-be detective Johnny Goodlittle to stop him. It is fun, suspenseful, with a great use of mood and irony. The Black Bird features the combination of Tod Browning and Lon Chaney and is not to be missed. Chaney's character is a notorious thief called The Blackbird who pretends to be his twin, a crippled missionary known as The Bishop. Not the first time I've seen him play a character with a secondary identity, which he does brilliantly in this film. The supporting cast really shine in this movie especially Renée Adorée and Owen Moore who play The Blackbird's love interest and rival, respectively. Great ending and a really beautiful score by Robert Israel. The Unholy Three not only stars Chaney but it also features Harry Earles from Tod Browning's Freaks. Seeing one dressed in drag and the other dressed up as a baby is pretty funny. I nearly died of laughter seeing Earles with a cigar in his mouth wearing a toy fireman's helmet. I swear he had to be the inspiration for the Baby Herman character from Who Framed Roger Rabbit. Browning really nails the suspense throughout the movie especially in the toy elephant scene. The camera trick used during the "ape" scene at the end seems almost revolutionary for the time period. Great reveal during the courtroom confession and a happy ending of sorts. While it's not my favorite Browning film it's certainly an entertaining story and worth checking out if you're a fan of either Chaney or Browning. Dropout, you're doing a great job of picking great silent movies to watch and enjoy. I've been a fan of silent film for years and you've watched a few I've never seen. The Mark of Zorro, The Ace of Hearts, The Monster, The Black Bird. I've never even heard of The Dragon Painter. I love The Unknown. Did you notice the heroine was Joan Crawford? She's really good in it. Another criminally unnoticed silent film is The Wildcat, directed by Ernst Lubitsch, starring Pola Negri. You can hardly believe it was directed in 1921! My two favorite silent films are Sunrise and Pandora's Box. I'll watch Manhunter when I run across it. I had Amazon Prime for a month recently and I watched Hannibal Rising and rewatched Hannibal (2001), which I had originally screened at Union Station in DC, which is where they filmed one of the chase scenes. I di myself a favor last night and unplugged the QAM cable and plugged in the antenna so I could get the uncompressed picture and 5.1 surround sound. The sound design is just as amazing as the cinematography. I remember seeing this one at the theater when I was 14. I thought it was great! Then I saw it years later after I'd seen some of the earlier ones on cable ... and it's just OK. Dropout, you're doing a great job of picking great silent movies to watch and enjoy. I've been a fan of silent film for years and you've watched a few I've never seen. The Mark of Zorro, The Ace of Hearts, The Monster. I caught a ton of them of TCM Silent Sundays. Haven't watched one in awhile and not sure if they're still doing that though. I've never even heard of The Dragon Painter. I watched it on TCM and really enjoyed it. IIRC they aired it during Asian Images in Film month where they also showed a bunch of Akira Kurosawa and Ishirō Honda movies. I also discovered some really cool early Japanese horror movies like Jigoku (The Sinners of Hell) and Hausu (House). Really awesome stuff. Yeah Robert Osborne ( or Ben Mankiewicz) mentioned it on TCM. I enjoyed her a lot in William Castle's Strait-Jacket. I have not seen any of the films. They're sound engineer really doesn't get enough credit. It helps set the mood so perfectly. From the show's old days. Just about to start watching Once Upon A Time In The West. It's the full 2 hrs 46 min version on netflix. First time view for me. Though I have seen a lot of this genre of westerns. Sparrows was directed by William Beaudine, who was in the business forever. He is most famous for a bunch of famously bad movies, including some low-budget Bela Lugosi thrillers as well as Billy the Kid vs. Dracula. Sparrows is very good. You would never guess it was directed by someone who is famous for his bad movies. That's How the West Was Won. 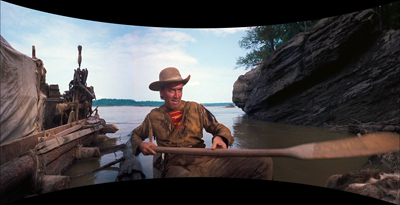 Once Upon a Time wasn't Cinerama. I enjoy those Busby Berkley musicals.Just for the spectacular dance sequences.They are absolutely insane.